While these channels may seem like straightforward categories, Google Analytics lumps traffic into a channel based on the source and/or medium. This means that the quality of the data depends on how good a job we do at tagging our campaigns. For example, traffic can end up being mis-categorized when non-standard tags are used. For example, if you use a non-standard medium for paid search (such as “payperclick”), the resulting Sessions won’t end up in the default Paid Search channel bucket. To improve your link tagging, visit our article on Consistent Tagging for Better Campaign Tracking. If you’re running email marketing through a platform like Mailchimp or Constant Contact, you’ll want to make sure that you’ve turned on the setting to tag links for Google Analytics. If you cannot find the option on your own, check with your email marketing provider to determine how to set this up. Alternatively, you can manually tag the links in your email campaign. This gives you more control over the campaign that your email traffic gets assigned to. Either way, without proper tag tracking you won’t be able to cleanly segment traffic as coming from email. Instead, visits will show up as referrals from the recipient’s email provider (such as mail.yahoo.com), as well as direct visits (clicks from mail programs such as Apple Mail and Outlook). With a properly tagged email campaign, you’ll be able to see the resulting Sessions in the “Email” channel. This will help you cross-reference the reporting data from your email provider with your actual site traffic and help determine how well your email campaigns are driving traffic to your website. When running advertising through AdWords, make sure you link your AdWords account to Google Analytics. If you haven’t connected the accounts together, AdWords Sessions will still be classified as “Paid Search”, but Analytics will not know which campaign, ad, or keywords drove the traffic. This lack of data will prevent you from accurately measuring the success of individual AdWords campaigns. If you are a digital agency, or in-house marketer, this missing information could undermine your ability to demonstrate the success of your PPC campaigns. You can check for proper AdWords attribution by making sure data is showing up in the AdWords section (Acquisition > AdWords > Channels). This will show you an overview of campaign performance, including engagement and conversion metrics. Once you’ve correctly linked accounts, you’ll see AdWords data categorized as either Paid Search or Display in the Channels section. Of course, these totals will lump together traffic from other channels in those categories, for instance if you’re running Bing Ads paid search in tandem with Google paid search ads. . While most organic Sessions will fall into the proper channel, some may come through as referrals. While this may only represent a small amount of traffic, you should note that these are part of the total when accounting for organic search performance. For example, some Bing Sessions have been showing up as referrals instead of organic visits. If the default channels don’t fully serve your purpose, you can create custom channel groupings to categorize traffic as needed. Just proceed carefully with attention to detail, as any misstep in the process can cause traffic to be misclassified. For this reason, we recommend that you never customize the default channel grouping, but instead create a new grouping to implement your customizations. Also, any changes to channel groupings only apply to future visits, not retroactively. Another useful way to get more insight from your data is to segment branded and non-branded paid search into separate channels. This edit allows you to separate metrics for people already familiar with your brand from those more likely to be having their first contact with your site. For more details, see Google’s instructions here. When running ads via social media advertising, you want to be sure to segment the resulting visits from organic social referrals. See our article on tracking Facebook advertising for more details. However, note that Google Analytics doesn’t include a separate channel for paid social by default. If social ad visits aren’t specifically tagged, they’ll get lumped into the broader Social channel. However, if you tag links with a medium of cpc, ppc, or cpm to indicate paid traffic, the visits will go into the Paid Search or Display channels. 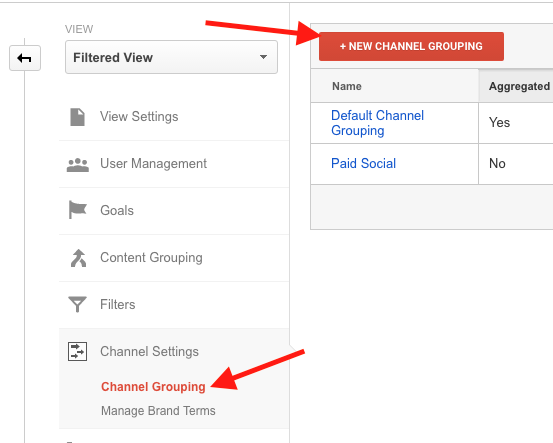 For a clean way of segmenting paid social traffic, you can create a new channel grouping in Google Analytics. Custom channel groupings allow you to view data within your own Google Analytics account without “breaking” the default channels. Under the desired View, navigate to Channel Settings and Channel Grouping. Next, click New Channel Grouping to create your custom channel. For this account, in which Facebook advertising is our only paid social effort, we’ll define a new channel with a Source of facebook.com and a Medium of ppc (representing how we’ve chosen to tag our URLs). After saving this Channel Grouping, we can view the data in the report. Of course, we can define other channels within this grouping to see more data, but for the purposes of this example we’ll stick with setting up the social portion. Under the Channels report (Acquisition > Channels), we’ll change the Primary Dimension to our new Channel Grouping of Paid Social. This will now separate the Paid Social (Facebook advertising) visits from other types of channels. The default Channels report in Google Analytics provides a useful basic categorization of traffic that enables you to compare the performance of various types of marketing. However, you should be aware of possible shortcomings in how Google Analytics determines what data falls into which channels. In addition, exercise caution in tagging links properly in order to ensure the best possible accuracy. Once you’re ready to move beyond the basics of reviewing channel data in the main interface, brainstorm custom channels based on your digital marketing campaigns to better segment your data. You can use channels to your advantage to improve your reporting, your analysis and your online marketing initiatives as a whole.